Tokyo is the capital of Japan and the most populous metropolitan area in the world. Formerly known as Edo, it is the seat of the Emperor of Japan, and the seat of the government since 1603. There are hundreds of things to do when in Tokyo, so here are a few of our suggestions. Tokyo Skytree – This tower serves as a broadcasting, restaurant and observation tower and is the second tallest structure in the world. The tower offers a 360 degree view of Tokyo and also houses a shop, cafe and restaurant where you can enjoy your food while looking out over the wonderful view. The tower is open from 8:00-22:00 and you can either book in advance or go to the ticket counter when you arrive. The restaurant is open for lunch and dinner, both of which have three set menus to chose from. There are example menus here but they are subject to change. It’s recommended to book a table and the opening hours are 11:00-23:00. Meiji Jingu Shrine – Meiji Jingu is a Shinto shrine, Shinto being Japan’s ancient original religion which values harmony with nature. The shrine was established in 1920 in commemoration of the virtues of Emperor Meiji and Empress Shoken who passed away in 1912 and 1914 respectively. The forest was planted by hand and is made up of the 100,000 trees that were donated from all over Japan, with some coming from overseas. When visiting Meiji Jingu it’s important to follow the etiquette guide which can be found here. As the website states, these actions show respect and are not related in any way to religious belief. Shinjuku Gyoen National Garden – This huge garden was opened to the public after the Second World War and has three distinct types of garden: French Formal, English Landscape and Japanese Traditional. This garden has more than one thousand cherry trees of over a dozen different varieties, including early and late blooming trees. 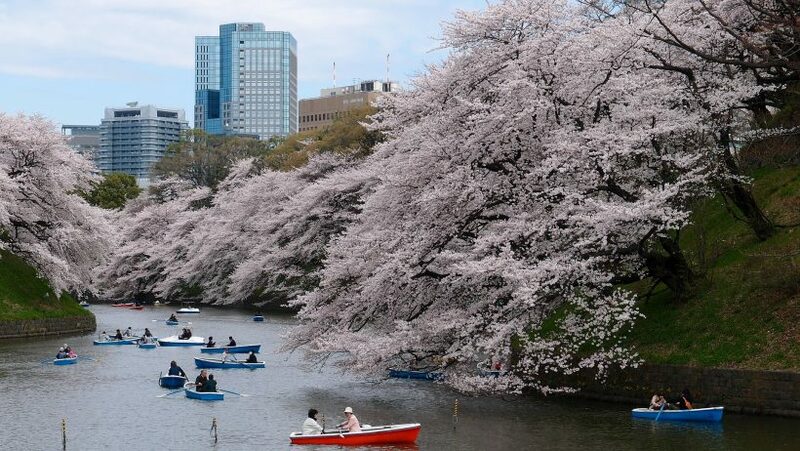 This means that while the peak time to see cherry blossoms is late March to early April, this park is still likely to have some trees in bloom if you miss the main season, giving an extended viewing season from mid March to late April. Admission to the park is 200 yen and it’s open from 9am to 4:30 pm except on Mondays when it’s not cherry blossom season or the Chrysanthemum Exhibition in the first half of November. Other attractions include: a day trip to Mount Fuji, Tokyo National Museum the country’s largest museum which specialises in traditional Japanese art, and the Studio Ghibli museum for fans of the Japanese animation studio, Studio Ghibli. Mandarin Oriental, Tokyo – This five star luxury hotel offers breathtaking views of the city from some of the most spacious rooms in Tokyo. The hotel is directly attached to the “Mitsukoshi-mae” subway station and is also within walking distance of the main shopping and entertainment destinations. When it comes to dining there is a wide range of restaurants and bars available, three of which have Michelin stars, including French fine dining, authentic Cantonese cuisine, “Edomae” style Sushi, freshly baked roman-style pizzas and a Mediterranean buffet. Hakushu – This family-owned teppanyaki restaurant was created almost 50 years ago and is one of Tripadvisor’s top rated restaurants in Tokyo. They are particularly renowned for their rich Kobe beef, available as a filet or sirloin, which the chef will prepare in front of you. There are only 20 seats in the restaurant, so booking by phone is highly recommended. While the staff do speak basic English, it is probably best to ask your hotel, or a local friend, to book a table for you. Hakushu is open everyday from 17:00-23:30, except Sundays and national holidays.